The Classic 165--the boat you've read rave reviews about and the boat you will enjoy for many years. 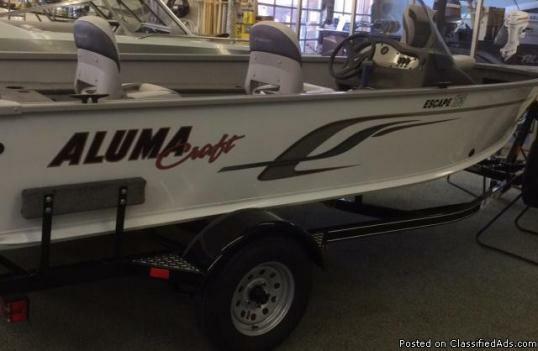 We bought this boat new and have loved it, so much that we upgraded to a larger Alumacraft. This boat is special because it has a 2009 Yamaha 2 stroke 50 hp (the last year Yamaha made a 2 stroke) much lighter and easier to maintain than the new 4 stroke motors. Boat will top out over 30 mph with 3 adults. We have babied this boat and motor, very few hours, always run in clean NY finger lakes and always winterized and stored under roof until recently. 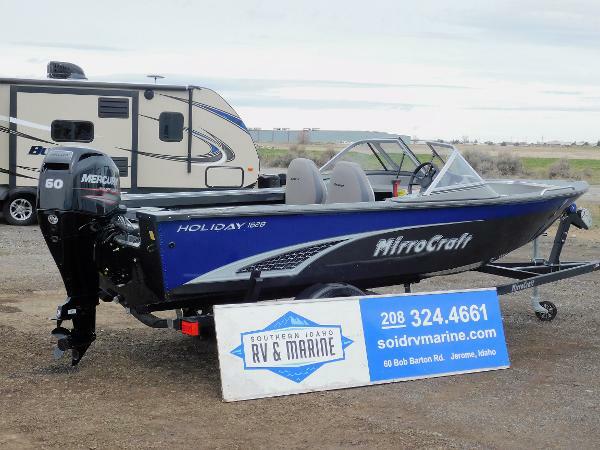 Full instrumentation, large auto-fill-drain livewell, lockable rod and gear storage, all carpet interior, open floor plan easily accommodates 4 fisherman, all functions work well and the famous "Alumacraft Ride" double hull allows for smoother ride in rough water that similar boats . All this in a fuel friendly, easy towing package for smaller vehicles. 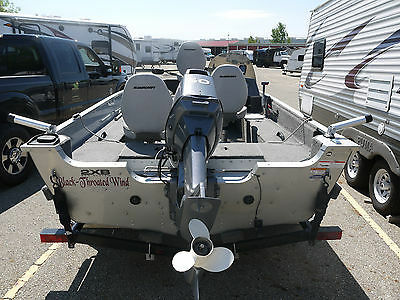 Includes heavy duty cover, trailer, trolling motor, 2 x matching fish finders (one on console and one on bow with trolling motor mounted transducer), 3 seats, cup holders, vertical pole holders and mounted trolling pole holders, spare tire, batteries and all manuals. If you are in the market for a new boat look at this first. 2015's are going for $19k! This is a quality made boat with heavy duty latches and hinges and metal floor that will last. 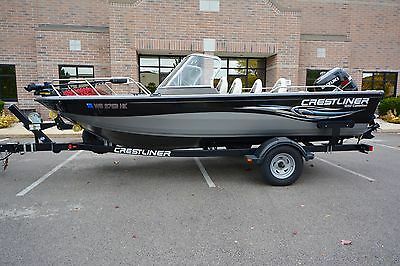 2013 Lund 1650 Rebel XL Sport UPGRADED Fisherman's Top with Full Enclosure, UPGRADED Downriggers, UPGRADED Humminbird Fish Finder, 16-Gallon Bow Livewell, MinnKota PowerDrive V2 Trolling System, Mercury 60 ELPT FourStroke, EFI, 56 Freshwater Hours, Engine Warranty, Dual Consoles, Cell Phone Cubby, Port/Stb Rob Storage, Huge Bow Casting Platform, 3 Removable Seats, Battery On/Off Switch, 12V Outlet, Galvanized Trailer with Spare. The Lund 1650 Rebel XL - Never before has a small fishing boat offered all the features and superior fish ability of a large fishing boat. The 1650 Rebel XL is one of the best small aluminum fishing boats on the market, a true rebel on the water. Visit semperspeedandmarine.com for more photos of this boat. Semper Speed and Marine is California's #1 boat dealer for new and used models from Sanger Boats, JC Pontoons, Eliminator Boats, Nordic Powerboats, Monterey Boats, Alumacraft, Smoker Craft, Premier Pontoons, Cobalt, Mastercraft, South Bay, Malibu Boats, Natique, Tige, Axis, Moomba, MB Sport, Calabria, Ski Supreme, Tracker Marine, Fountain Boats, Larson and more. If we don't have it, we'll get it for you. Contact Us for more information regarding Financing Toll Free at 866-865-7619. Live outside our area? No Problem. We specialize in shipping boats all over the world, including AL-Alabama, AZ-Arizona, CA-California, CO-Colorado, FL-Florida, GA-Georgia, ID-Idaho, IN-Indiana, IA-Iowa, KS-Kansas, KY-Kentucky, LA-Louisiana, MI-Michigan, MN-Minnesota, MT-Montana, NV-Nevada, NM-New Mexico, OK-Oklahoma, OR-Oregon, TX-Texas, UT-Utah, WA-Washington, WI-Wisconsin, WY-Wyoming. *Price, if shown, does not include government fees, taxes, dealer freight/preparation, dealer document preparation charges or any finance charges (if applicable). Final actual sales price will vary depending on options or accessories selected. - LOW HOURS, TONS OF UPGRADES, FULL ENCLOSURE, DOWNRIGGERS, FISH FINDER AND MORE! !